Solar powered containers provide year-round greens. Delivery, please. Another novel aspect is Curren was able to essentially order two ready-made container farms and have them delivered to her Bozeman, Montana, acreage. “They show up, you flush the system, and you’re a farmer by week 2,” she says. The farms are custom made by Freight Farms with as much recycled material as possible. 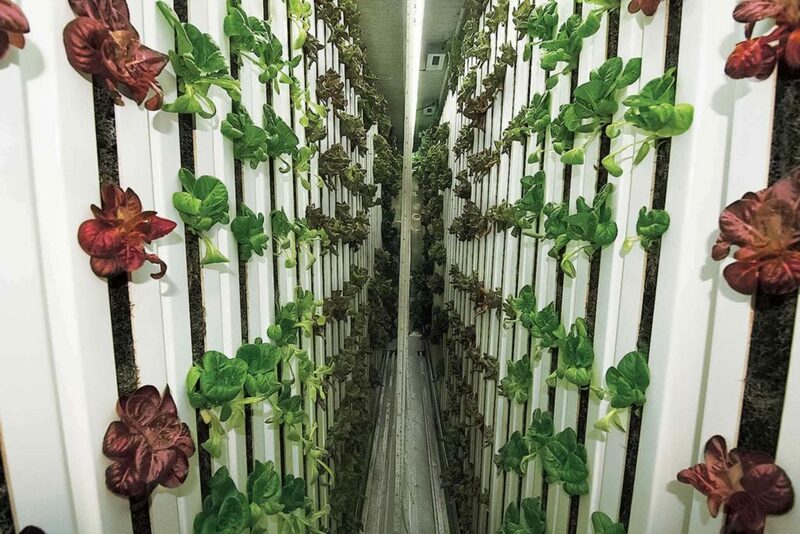 The 9-by-40-foot containers with 8-foot ceilings utilize 256 vertical grow towers, which resemble house gutters hung up by one end with plants emerging from their length at regular intervals. Each side of the container is lined with two rows of towers facing each other with LED grow lights dangling between. Strips of LED grow lights dangle between rows of lettuce and microgreens. Irrigation runs along the top of the towers, pumping water through the system and recycling it back to a 130-gallon water tank. The system uses just 10 gallons of water per day and all water is UV and reverse osmosis filtered to reduce contaminates. The temperature is maintained at 62F year round. “This is the optimum temperature for lettuce and leafy greens to be sweet and delicious. We can maintain that prime temperature in the heat of summer and the cold of Montana winter,” Curren says. Custom greens. Curren spends about 40 hours per week starting seeds, transplanting, harvesting, delivering and doing maintenance on her two container farms. She can grow 4,000 plants in each 40-foot shipping container and have a good harvest every week. A wide variety of lettuce, microgreens and herbs do well in the containers which she sells at a premium directly to local chefs and at farmers markets. Harvest takes place in the early morning on delivery days. “I don’t harvest anything in advance because I want everything to be as fresh as possible. My customers expect quality and I inspect every leaf that goes in the bag,” she says. The product is superb. “Kale, for example, grows differently in this controlled environment. It grows steadily and consistently. It’s very tender and sweet, you don’t even have to cut out the veins so the chefs can use every pound I send.” Each 4-gallon bag brings in $10. Housing the farms under a pole barn helps with efficiency, including reducing snow shoveling in the winter. 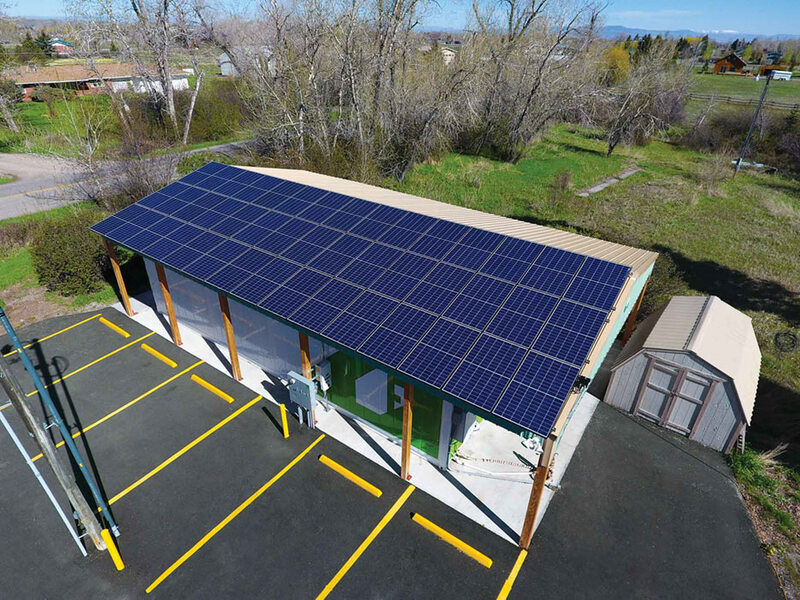 Curren took an extra step by utilizing solar energy to power her farms. In a typical week, Curren will harvest 30 pounds of greens, such as kale, chard, arugula, herbs, and more. During farmers-market season she harvests 500 heads of lettuce per week with 150 to 200 going to accounts and the rest selling at local farmers markets and direct to the community. Sunny idea. Having worked in renewable energy, it was a natural step for Curren to customize her farm by adding solar panels. Each of her two farms uses around 110 KWH per day, and her solar system produces between 30% and 50% of daily power needed in summer. “I went out on a limb to do solar, but I was able to get some grant money and it cuts down on my energy expenses,” she says. Each farm covered its own operating expenses immediately and in a few short months were covering the loan and generating some profit. “I just wanted to bring a better, fresher, local, and year-round product to our community,” she says. One woman’s mission to return injured wildlife to the wild. This Swiss cow didn't get her close-up...until now!